I don't want to call it a 'comeback' (he's been here for years) but Haritama Hiroki's Comiket 79 release Mile Stone is probably the first illustration collection I've seen from him since his 2004 art book Splendor. Though the works collected in Mile Stone aren't all new, they bridge the gap between between his last publication and the present. 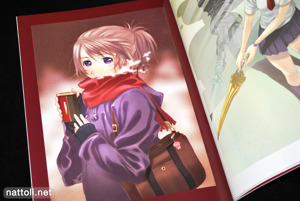 Mile Stone is A4-sized doujinshi and 28-pages when counting the covers. 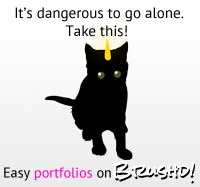 It's full color and presented one illustration per page, so everything gets a full page display. 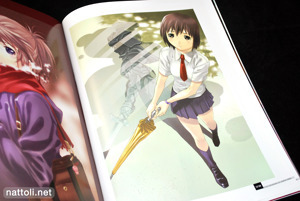 The cover art is newly drawn, and a less cropped version of the illustration is repeated on the first page. 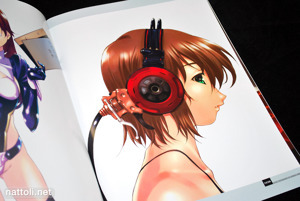 In total, there are 21 illustrations ranging from 2005 to 2008, with the exception of the cover art. It's a pretty good amount especially for a doujinshi, but I do hope this means now that he's caught up, we can expect more new art works in future doujins.